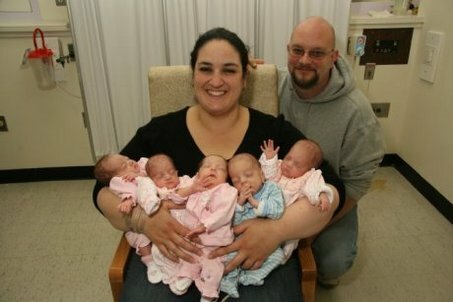 The first two of the quintuplets born to Staten Island couple Jamie and Kevin Ferrante spent their first night at home last night. The pair became the proud parents of four girls and one boy on December 27, but only Alessia and Emily came home Wednesday night. “It’s amazing; it’s real and it’s here,” said dad, Kevin, who caught a little sleep in between feeding Alessia — who now weighs 4 pounds, 1 1/2 ounces — and Emily — who is 4 pounds, 3 and 1/2 ounces — every three hours or so. Matthew Ferrante is expected to come home by the end of the week following hernia surgery. The littlest quintuplets, Amanda and Ella, still need to remain in the hospital to gain weight. “They just have to gain a little weight; they’re all off the oxygen,” said proud but exhausted dad, before heading out for the hospital for feeding, a routine he and his wife have been keeping for weeks. Tuesday night the neonatalogist told them to get lots of sleep because it will be the last time for a very very long time.